There are a number of good news items to report. Wood Farm has finally been handed over to Council control and is now under the management of the Greater Stanmore Country Park Management Committee. The pedestrian gates into the site are now unlocked, though the car park is still locked. We hope that we can arrange for volunteers to open and close this each day. As soon as the budget is finalized and agreed we can begin work on the site, for example mowing the grassy rides that loop around the site. Wood Farm comes with a small but attractive visitor centre, which means that we now have a base to host school parties and local events. The first of these will be on Saturday February 27th, when Huma Pearce will train a number of us in surveying for small mammals as part of the larger “Vole Patrol” project. A long term aim of John Hollingdale’s management at Stanmore Country Park is the creation of grassy rides to connect all the glades and open areas. This will help insects, in particular butterflies, which can use the rides to travel between the different spaces. It should also help grass snakes, which will travel through woodland but prefer woodland edges. Two further steps in this process were completed this winter. First, work by our own volunteers led by Simon Braidman and Sue Kabel, aided by TCV working parties, have widened and cleared the Gas Main Ride, which connects on the west with the open land of Wood Farm and on the east with Upper Blue Pond Field at nature trail post 15. Second, the Dragon Finder programme, managed by FrogLife, paid for the clearance of a wide ride running up from the picnic table at 6 Acre Field to connect with the Gas Main Ride. This rescued a grassy glade that was hidden within the woodland and would soon have disappeared. The next step in this grand project is the restoration of John Hall’s Field, aka Ant City, which we hope will be funded by the Council’s Green Grid programme. Many of you will be aware that in March 2015 Harrow Council was awarded £3.6 million to restore the buildings at Headstone Manor and build a new welcome centre. Now Nishma Patel at the council is putting together a second bid to rewild the Yeading Brook West both upstream and downstream of the moat. As well as providing wetland habitat in itself, it will improve the quality of the water entering the moat and prevent the silting up that has necessitated repeated dredging operations. The Forum has written to express its support and willingness to welcome a Friends group into the Forum. Simon Braidman, Sue Kabel and John Winter are keen to introduce identity cards to be used when they are challenged, whether by the public, Council officers or the police. The cards would also give emergency contact details and list special qualifications such as chainsaw and first aid training. John is at present moving forward with the first step, creating cards for those people who have keys to the Forum tool store. A less positive piece of news concerns our Harrow Council small grant. Our present grant has been extended for six months, until the end of September 2016, with the payment of an additional £2000. This will pay for our insurance policy, 1000 each of A3 and A4 leaflets, and our pitches at May Day and August bank holiday at Headstone Manor. However it is unlikely that the small grants program will be renewed after that date. We do have money in the bank as a result of, for example, the work we have done in designing the Bentley Priory Circular Walk information panel and hosting young people doing their National Citizenship Scheme with The Challenge Network. One source of funds that we are hoping to tap in future is Countryside Stewardship for Stanmore Country Park, which would yield £3,400 per year. The next step in the process of applying for these funds is the creation of a management plan in a “UK Forestry Standard compliant” form. My hope is that by going through this route we can get enough money for Stanmore Country Park to pay a grazier to bring cattle to 40 Acre Field. Signalling flies (Poecilobothrus nobilitatus) were observed on the woodland pond in early autumn. These unusual flies, which move across the surface of standing water, have distinctive white spots at the tips of their wings. They appear to communicate through elaborate semaphore type signals, hence their name. The pond dipping platform has been extended to allow access from the both side and a sluice gate has been installed to retain a greater volume of water in the pond. Some additional clearing of small trees has further opened the canopy south of the pond, permitting more light to penetrate. Butcher’s Broom (Ruscus aculeatus) has been found growing under a yew on the east side of the wood. It is almost certainly a garden escapee from the old Vicarage grounds. The churchyard bees have produced a fine crop of honey (30 plus jars). The Forest School has continued, working mainly with small groups of children from Harrow primary schools. The first Saturday of the month working parties have continued to meet, albeit with only a few enthusiasts. There will be/have been Green Grid funded improvements to paths. Boot Pond Working with Froglife, shallow water at one end of the pond was isolated by building a dam, creating Toe Pond. The dam was planted with yellow iris. New Pond was also created and this was planted with vegetation transplanted from the Dragonfly Pond at the north of the site. These create valuable habitats for amphibians and aquatic insects. The site has hosted local groups, such as young people from The Challenge, the Harrow Natural History Society and the local scouts, and guided walks run by Simon Braidman as part of the Herts and Middx Wildlife Trust Programme of Events. Newton Farm is without a warden at present. Being a warden of a small site like this need not be time consuming. To find out more, contact Steve Bolsover on admin@harrowncf.org or by phone on 1779 483 7302. 1. Restoration of the old orchard is coming along splendidly with just a few trees left to clear this winter. We had our first 'Apple Day' on 19th Sept. It was the most well attended event we have held in PW and was a great success, the sun shone and everybody went home laden with apples. We provided seating and refreshments (all apple based) and I gave a short introductory talk about heritage orchards, why they are important (BAP Priority Habitat) and what we are doing here. A hedgehog house has been installed, more refuges added and some wild flowers planted and sown. We had orchard specialist Gerry Edwards come in and identify (most of) the varieties we have. Some are family trees (i.e. more than one variety per tree) and some are rare. Even Gerry found it challenging so that is exciting news. Helenka and her team from The Grimsdyke Hotel also came to visit and discuss all things orchard with Rosemary and I. We are currently working on a planting plan for next winter. 2. For the first time, a broad path has been mown around Ten Acre Field (TAF). There is a loop running around near the edge and also a couple of paths crossing the field. The feedback that we have had from this so far has been really positive, with people commenting how pleased they are to have access to this area. We've been able to get this done due to the gate being put in from Brockley Hill. Plans for the future include installing a couple of benches in the viewing area at the top end and possibly felling a few of the ash trees in the field to open up the view. 3. Steve, Simon, Leslie and I supervised a group of youngsters from the Challenge organisation on the weekend of 26th and 27th Sept 2015. They worked in the new GSCP and PW. The group in PW made paths and cleared fallen wood from the main bluebell area. 4. We had our annual Fungus Foray on 10th Oct. It was very successful and well attended with the weather staying dry. We found over thirty species of fungi, the most spectacular being an Orange Peel fungus located near the gate. 5. TCV day working on the Grimsdyke on 16th Nov. Cutting back holly and treating with a stump treatment. Well attended and job was completed with all cuttings burnt. 6. Elizabeth Whitbourne and colleagues came from English Heritage on 1st Dec. to inspect the Grimsdyke ancient monument. I am pleased to report that they were very happy indeed with the progress we have made and thanked us. 7. Peter Elton has made a fantastic job of clearing large, thick, encroaching holly in the standard oak with hazel coppice area that leads down to the lake. This is a huge and ongoing job that will probably take several years. 8. The helleborine orchid appeared again this year after a short absence. Rosemary is giving a talk about lichens on 14th March at the Blackwell Hall at 8.00pm. Harrow Natural History Society, guests welcome. We would like to thank Peter Elton for all the hard work he has put in at Pear Wood. His help in the orchard and elsewhere in the reserve has been invaluable. Dave Bolton reported that the feedback regarding the new gate at the entrance at the top of the steps has been very positive. Railtrack carried out some clearance work in early December following a Hawthorn falling on the tracks. This left the site rather exposed with clear views of the houses. Dave reported that he has planted a couple of Beeches to remedy the situation. Work has continued on clearing the ditch and putting pipes under the paths. This has ensured the paths have remained dry (much appreciated by joggers). More Litter Bins have been placed in the area thanks to the Friends of Roxbourne Park. It has been pleasing to have one or two extra volunteers in October and November. BLUEBELL HEATH There has been a total of 390 hours of work on Bluebell Heath since the last report. This has virtually all been scrub clearance. Notable has been the re-clearance of the bare earth banks at the backs of New Heath and New Scrape. A special thanks must go to IMG, the corporate group on 15.10.2015 and to John Winter and a team of keen volunteers on 22.11.2015 for doing such a great job. One of the best finds were new Sheep’s Sorrel (Rumex acetosella) plants in Parcel 5 in Bluebell Heath West. There has been a total of 219 hours of work on non Bluebell Heath work. There is a need to open up the woodland and to control Holly and to disturb in places the leaf litter layer. Footbridge blocked by fallen Oak at Pynding Mersc reported to Council. VOLUNTEERING We are getting new volunteers and some are becoming regular. A new trend has been families attending work parties and we have had 4 or so coming from time to time. We now have a new ride, funded by the Dragonfinder project. This is to encourage the movement of reptiles, butterflies etc. throughout the site. We are very pleased as this has been one of my ambitions for many years. Peter Elton has put in hours of maintaining our paths with his machine. He also did hours of scything back bramble too; 45 hours in total. The SEWA day volunteers cleared away the cut bramble etc. that Steve had produced in the previous two days with the brushcutter. Saira and Maria have helped us with various projects including scything and cutting back the encroaching bramble around Ant City. Steve has brought the chainsaw along to clear a large fallen tree from the nature trail and to further coppice willow in Six Acre Field. We have regularly walked the nature trail to remove smaller fallen trees and encroaching vegetation around the trail posts. 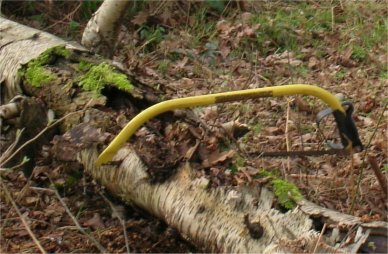 Finally the party of volunteers, led by Sue and Simon, removed more cut material produced by Steve and recently planted some Alder Buckthorn whips along the new ride created by the Dragonfinder project. They then spent the rest of the day clearing back bramble and birch along the gas ride. We are very grateful for all the help we have had and would like to thank them all. The Dennis Lane car park is now locked 24 hours a day as the Council cannot provide the manpower to open and shut it. Two pairs of mallards are spending the winter on the ponds along with the coots and moorfowl (and the inevitable gulls). The reserve was well used in November- December, mainly by families from the various festivals at the neighbouring Islamic Centre and Hindu Temple, taking advantage of the mild weather. Unfortunately, the dreaded Parrot's Feather (Myriophyllum aquaticum) has returned to Caesar’s Pond, but the Council have been alerted and are planning to remove it yet again - their indefatigable efforts are much appreciated.